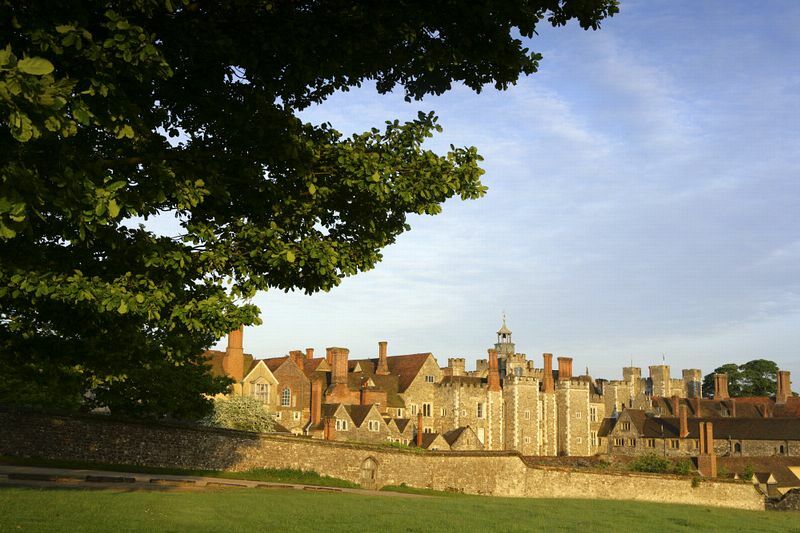 Knole Park is just the place to combine a round of golf with a historic and interesting National Trust property. Knole Park Golf Club is uniquely located on part of the 1000 acres of deer park which, together with the mansion, make up Knole Park. The golf course was opened by Lord Sackville in 1924 when he took the first shot on the J. Abercromby designed course. To preserve it during World War 2, members had to resort to placing major objects on the fairways to prevent enemy aircraft landing. on horseback near the Bird House. Non-golfers can find other ways to enjoy the spendours of this magnificent estate, said to be the largest private house in England. This splendid Tudor house has been in the Sackville family since 1566, when it was given to Thomas Sackville by his cousin, Elizabeth I.
Knole Park was originally built by the Archbishop of Canterbury, Thomas Bourchier, in 1456 when the earlier house was demolished. It was created as a country retreat and hunting ground for himself and future Archbishops of Canterbury. Henry VIII took a shine to the prized estate and forced his Archbishop of Canterbury, Thomas Cranmer, to hand it over to him in 1538. Today the house and approximately 43 acres of the park is managed by the National Trust. Lord Sackville and his family still live in part of this grand house. Knole Park can name-drop with impunity considering its royal connections throughout its extensive history. Writer Vita Sackville-West was born here and went on to buy Sissinghurst Castle Garden and create the splendid National Trust owned gardens there. 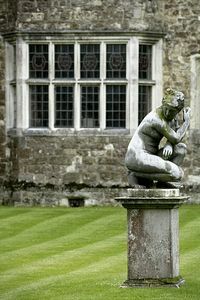 Her friend Virginia Woolf spent much of her time at Knole Park and based her novel "Orlando" on the Sackville family history. A copy of her bound manuscript is on display in the house. treat at every turn. They are laid out much as they would have been in the 18th century. It is said to be a "Calendar house" with 365 rooms, 52 staircases and 7 courtyards. Look for the leopards on the newel posts of the Jacobean staircase, appreciate the Royal Stuart furniture collection and admire the fabulous works of art by Gainsborough, Reynolds and Van Dyck among other great artists. The Great Chamber has a vividly carved fireplace and overmantel. There is even the first ever high-sided "Knole settee" which was specially designed in 1610 for Knole Park. The gardens close to the house are sheltered by a wall and include formal gardens and lawns and the informal "Wilderness" area. 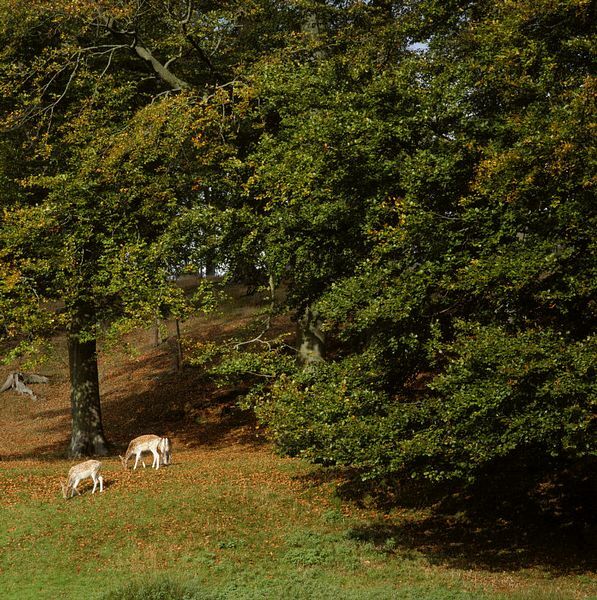 The medieval deer park, the only one remaining in the country, has been designated a Site of Special Scientific Interest. The grounds feature a mixture of wild flower meadows, woodland and wetland habitats. 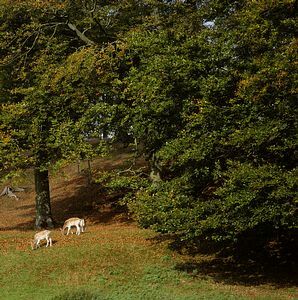 The deer park at Knole Park has changed little in the last 400 years although 70% of the mature trees were lost in the Great Storm of 1987. The herds of fallow and sika deer are surprisingly tame and wander freely throughout the park, even nibbling the grass on the golf course! Knole Park has a newly opened Visitor center, a shop and a café for refreshments and cream teas in the Brew House.